Tag Archives for " Guild Guitars "
The photo above is of my Guild D 50 NT, an instrument I’ve had a bit of a love affair with since 1982. I’m pretty sure that if my house was set to burn down and all life was safe this is the thing I would go back in to secure. I’ve not always treated it as such, but it’s special. Like pretty much anything worth writing about there’s a story about how I came to acquire this fine guitar. When I came home my wife insisted that I use the money to get this guitar. We had no business spending that kind of money on this purchase, but I had always loved the big, deep, rich sound of the giant D50 dreadnaught, even above the more popular and more chimier Martins. Artists like Johnny Cash, Mississippi John Hurt, Emmy Lou Harris, John Denver and Richie Havens made the Guild Jumbo 12 string, D50 and 55 extremely popular on the 60s and 70s pop scene. 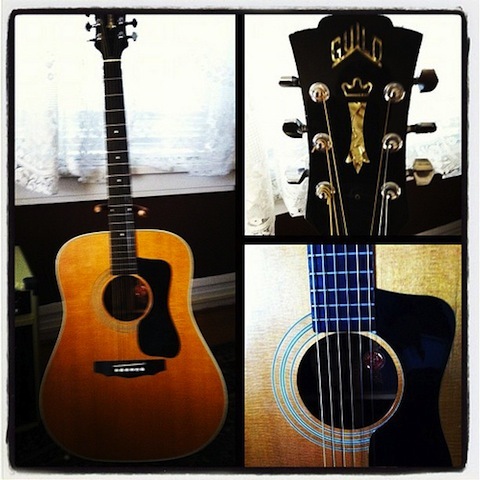 These guitars hand made by Guild in its Westerly, Rhode Island plant are still some of the best guitars ever made. My Guild was one of the last made in this famed plant as the company fell on hard times and only recently resurrected the hand made USA production of the Guild brand D50 and 55 under the watch of Fender Guitars in New Hartford, Connecticut. So, stop by some time and I’ll play you tune and we’ll swap stories about love found and lost – the stuff of many a wonderful story.